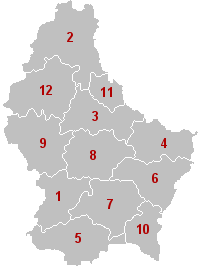 The 12 cantons (French: cantons, German: Kantone, Luxembourgish: Kantounen) of the Grand Duchy of Luxembourg are areas of local government at the first level of Local administrative unit (LAU-1) in the European Union's Nomenclature of Territorial Units for Statistics for Eurostat purposes. They were subdivisions of the three Districts of Luxembourg until 2015, when the district level of government was abolished. The cantons are in turn subdivided into 102 communes (i.e. municipalities). Grevenmacher is a canton in the east of Luxembourg. The canton's name derives from its principal municipality, Grevenmacher, a commune with town status. Neither the canton, town, or commune of Grevenmacher should be confused with the former district of Grevenmacher, one of three administrative units in Luxembourg abolished in October 2015. Neunhausen is a village in north-western Luxembourg. It is part of the canton of Wiltz, which is part of the district of Diekirch. Previously it was a commune – the smallest in Luxembourg in terms of both population and population density – until it was merged with Esch-sur-Sûre in 2011.